Swedish Police Interrupt Refugee's Wedding: A Violation of Civil Rights? 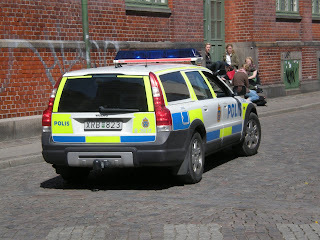 On Saturday 19 December, 2009, Swedish police interrupted a wedding in the city of Malmö, in Southern Sweden. The wedding was aborted as the police used pepper spray on the 24-year old groom before he was arrested. The man in question is a refugee from Afghanistan. His application for asylum was rejected and he "disappeared" to avoid deportation. Prior to the wedding, the man was at large and wanted by the police. Somehow, the police got information that he was to wed at the city hall in Malmö. Anders Kristersson of Malmö Police Department said, "we knew that they were going to the city hall. We had to act before they managed to perform the ceremony." He said pepper spray was used because the Afghan man resisted arrest. The question is, was the interruption of the wedding necessary? Was there a violation of the bride and groom's right to marry? Did the events of 19 December, 2009 amount to a violation of the civil rights of the Afghan and his bride? Many have argued that the groom was an undocumented immigrant and has no protection under the law. The last time I checked, Article 23 (2) of the ICCPR did not make any exceptions. Besides, the groom did not pose any immediate threat to national security or to society. The police already had the information that he was wedding at the city hall and had the power to arrest him after the ceremony. There's no evidence pointing to the fact that the groom would "disappeared" after the ceremony. The police were not under any pressure to arrest the groom the way the did. It was bad timing. In my opinion, the interruption of the wedding by the police was unnecessary and amounted to a violation of the civil rights of the Afghan and his bride. There's some reason to believe that the police interrupted the wedding for fear that marriage to a Swedish citizen would have an effect on the man's deportation. But a representative of the Swedish Immigration Board (Migrationsverket) said, preventing the wedding was unnecessary because marriage to a Swedish citizen wouldn't have any effect on the man's deportation because the decision for deportation had already been made. I agree with the Migration Board communication manager, Jonas Lindgren, who said the police had abused their authority. The Malmö police responded promptly, in a bid to get an undocumented immigrant off the streets of Sweden. However, I'm afraid the police just bought the immigrant some more time in Sweden. With a good lawyer, justice would be served and his right to marry restored. If he's not happy with the decision of Swedish courts, after exhausting all domestic remedies, he reserves the right, under the First Optional Protocol of the ICCPR, to complain to the Human Rights Committee. But, his days in Sweden are numbered because the deportation decision by the Migration Board would not be affected.